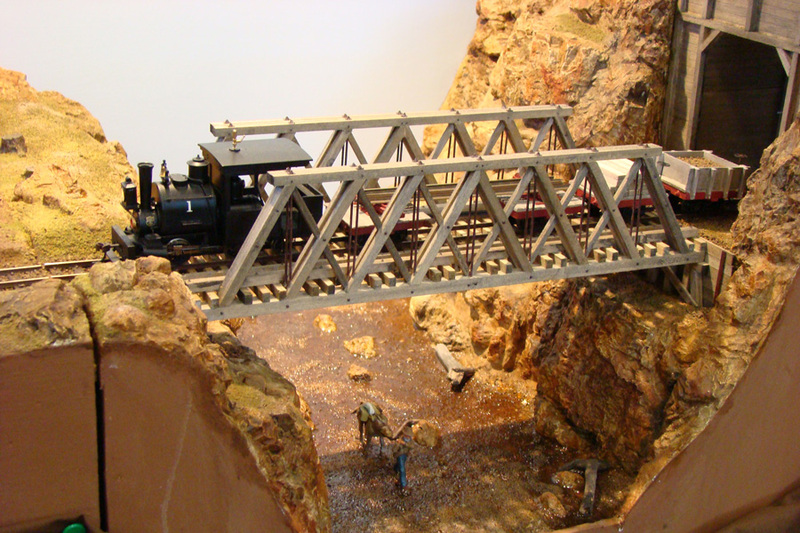 I recently had to revisit the art of building rocky scenery for my son’s ‘Silver Creek’ On30 layout. You will have noticed that I referred to it as an art because the techniques employed are as close to painting as I am ever likely to get (other than putting Dulux on the lounge wall). I employed the tried and tested method of rubber rock moulds (Woodlands Scenics) and plaster of Paris. Don’t be fooled into attempting to use DIY filler as the two substances are not the same and the resulting ’rocks’ will not have the right surface texture to accept paint. I have used B&Q economy filler to ‘fill in’ the areas that I intend to be covered in scenic material as the drying time is considerably longer than plaster of Paris. With regard to the colouring of the rock I used artists acrylic paint, mainly umber, burnt umber and burnt sienna. I have not tried the ‘craft’ acrylics but having got good results from artists colours I decided to stay with what I knew.